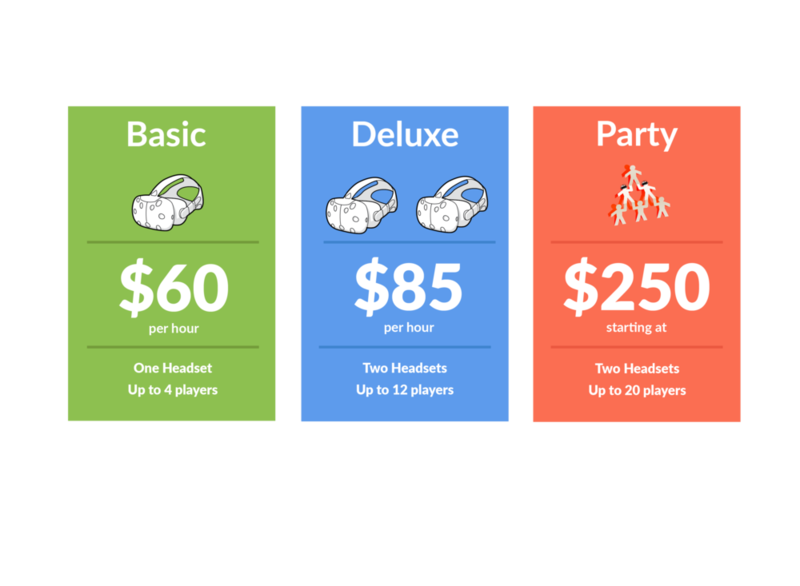 Whether it's with friends or company gatherings, our studio is a perfect space for VR gaming. IT'S THE KARAOKE ROOM OF THE FUTURE! How does this VR Arcade thing work? Our arcade is one large room with 2 HTC Vive headsets and a POV projector on each wall. This gives players enough space to walk, duck, or swing around without worry, and also gives spectators a fun view of the action. We recommend 1 - 12 players in order for everyone to get a good amount of time in the headset. Our space can accommodate larger groups by request. Can I have a birthday party here? Props to you for finding an awesome party spot. YES! We have an adjacent kitchen for BYO beverages, food and cake. We also have an upstairs green room and large parking lot for bigger events. All reservations must be made online, 18 hours in advance. NO WALK INS PLEASE. What is the age range appropriate for VR? The headset is designed to fit ages 10+. Our most popular option is 2 headsets for 2-3 hours. This gives each person in the group enough time to try out all of the best games. We have an open refrigerator for food and beverages. Alcoholic beverages are permitted. Will VR make me nauseous? Room-scale VR is different than phone-based VR. The Vive headset and controllers track your exact position, with no perceived lag, so you really feel like you are somewhere else. We like to say it's the Cadillac of VR headsets. So if you don't like Cadillacs, we don’t know what to tell you.